All The Hottest ID Products! Antonio Pacelli have over 40 years experience in producing Irish dance shoes, pumps, socks and accessories. Our jig shoes and Irish dancing pumps are worn the world over by dancers of all levels, from World Champions to eager beginners. Whether you need the best in tip and heel technology or a good value pair of hard shoes you will find the perfect pair in our large online shop. Our online selection incudes Antonio Pacelli, Hullachan, Fays and Rutherfords. Sore feet or looking for wide shoes then why not try the founder of Antonio Pacelli's wide fitting shoe site for a comfy pair of shoes! Ballinvilla has it all. With over 6000 soft shoes and 8000 hard shoes sold. Your #1 Stop for Shoes. Also carry CDs * socks * sock glue * Kelso travel wedges * anti-blister booties * and much more! Beat is a subscription-based app which provides users with Irish dance music which has been designed to suit all dancing organisations. The music library contains music for Grades, Championships, Set Dances and Ceili Dances. * Stream thousands of Irish dancing tracks from our constantly expanding library. * Download tracks and access them offline. * Access our set dances library which encompasses all set dances at the required speeds for all dancing organisations. * Create and personalise playlists for class, practice, or for whichever mood you are in. * Play any track, at any time, on your phone or tablet. * Search for your favourite Irish dance tunes. * Powerful media player with repeat and shuffle functions. * Lock screen playback controls. Buy with confidence. Bluestreak Crystals® is an Authorised Swarovski® Wholesaler located in the UK, offering the Largest Range of Swarovski® Crystals on-line globally to both retail & wholesale customers. Competitive prices, same day dispatch & unbeatable customer service. CRC is a weeklong camp that focuses on Irish dance fundamentals and basic skills. We assist campers in enhancing technique and achieving their personal goals. Come and see why we are rated #1 in Fun and Learning! At Camp Rince Nua, our mission is to present the vibrant Irish culture in a progressive environment. At Camp Rince Nua, our mission is to present the vibrant Irish culture in a progressive environment. We believe that atmosphere is everything. Throughout our lives, we all love to return to the experiences that have been joyful, positive and fun. Our goal is to give each camper a beautiful cultural experience and a life-long love of Irish Dance, its fun and its joy. The atmosphere is intentionally kept light and informal, but with enough structure to deliver a solid grounding in the fundamentals of footwork and timing, of body position and stage presence, while building confidence and friendships that last a lifetime. For over 18 years the Irish Dance division of Cheer Factor –The Warm-up Co., located in Eagan, MN a suburb of Minneapolis has been the “go to” apparel firm that has “pioneered” the most distinctive Irish Dance apparel across the globe. They now are introducing the latest technology the ALL New SubDi II warm-ups using a complete “Full Body Sublimation”design process, setting a new standard, which allows the director/academy owner total creative freedom. The design process begins with the dance school working with Cheer Factor’s fashion designers to create a one-of-a-kind look that reflects the dance school’s image and brand. Wisconsin's very own Irish Dance Shoe Source! We make it easy for you -We do studio and home visits! No more waiting for a Feis, or dealing with the hassles of guesswork and shipping! We specialize in Rutherford, Hullachan, and Antonio Pacelli. Soon to be carrying Fay's and Hallmore. Unprecedented service including studio and house calls. We also ship nationwide, please contact us for shipping rates. Dance Again has been proudly serving Irish Dancers and their families since February 2001. With over 12,000 dresses sold to date, buyers are guaranteed to see your dress. Browse over 2,000 dresses currently for sale. Lots of boys costumes available as well! We offer a full service website; send in your dress details and we will put together a great looking ad for you. We can edit your text and crop/edit photos for you, nothing is too much trouble. Your dress will be listed on the website and also featured on our Facebook and Instagram, giving maximum exposure for your dress. We also feature dressmakers and designers, dance supplies, message boards and more! At Dance City we stock the full range items needed for any irish dance event including; Irish dancing shoes soft shoes and hard shoes, irish dancing music, irish dancing wigs and irish dancing jewellery. Brands we stock are - Hullachan, Fays, Hallmore, iconic, Antonio Pacelli, Danka, Rutherford, Capezio, Iconics, Boynewalk, Inishfree, Rochvalley. Doire Dress Designs was founded in 2006 by Shauna Shiels. Shauna having been involved in Irish Dancing for many years with her daughters Tomasina and Codie had been creating dress designs for her girls as a hobby. Shauna like many other Derry mothers was extremely skilled in apparel creations having worked in Derry’s vas clothing industry since the age of 16. Her passion for Irish Dancing and dress making however started at an early age spending time with her mother Eilish Young who is an experienced dress maker. Shauna believes her skills, drive and passion for dress making and particularly Irish Dance Costumes have been inherited from her mother. Our aim is to offer a world class quality service whilst ensuring that we maintain an appreciation of the expense of having an Irish Dancer in the family. We believe our prices are a fair reflection of the quality of service and product produced. Shop Dreamtime Creations for the largest selection of rhinestones, beads, and trims for your dance costume. Choose from our four distinct brands–Swarovski, Alora, Preciosa, and Spark–to match your vision, style, and budget. Over 30,000 products in stock and ready to ship! Eire Designs was established by Gavin Doherty in 1999. Gavin brings his own flair and originality to every dress designed. At Eire Designs we aim to provide an original and stylish dress for every dancer. Feispix is a long-established family-run photography venture specialising in Irish dancing feiseanna and major championships. Its principal photographers are UK Surrey-based husband and wife team, John and Noreen Egan. For major events it is normal for three generations of the Egan family to be at your disposal. Irishman John Egan, with over 40 years experience in photography, has been involved in a range of photography and related fields including sports, portraiture, schools, weddings, social events, travel and journalism. He was correspondent for Irish dancing in the weekly Irish Post newspaper for many years. He also contributes to the international Irish Dance & Culture Magazine and to newspapers in the UK, Ireland, USA and Australia.He now specialises in Irish dance photography in which he has been involved for over 25 years. For a number of years FeisPix has been chosen as sole official photographer at the World, All Ireland, Gt Britain, British National and All-Scotland Championships, as well as various oireachtais (world qualifying events) and feiseanna in the UK, Ireland and in mainland Europe.If you would like FeisPix to attend your feis, or other event, please contact us but do give us plenty of notice. Our diary can be incredibly busy. Inishfree Irish Dancing shoes manufacture Hard and Soft Irish dancing shoes in Ireland for the past 25 years!! Our shoes are sold all over the world to shoe retailers, dance shops and dance schools. We are very proud that our Amazing soft AOIFE pomp and our PROFLEX heavy shoe is worn by the cast of both Riverdance and Lord of the Dance. So Trust the professionals at INISHFREE and be guaranteed a perfect step every time you dance. Terry Kelley, a licensed hairstylist, has been working behind the chair since 1979, specializing in haircuts and hair color on men and women in Downtown Phoenix. She did the hair on location for the Knight Rider TV show as well as many other commercials and films. Just a few of the famous people Terry has had in her chair, Barbara Bush, Norman Vincent Peale and Danny Ainge, all repeat clients. She has owned Youngblood Haircutters since 1990. Terry started the www.irishwigs.com business since 1995 when she got tired of curling her two daughters’ hair for Irish dance. The dancer's bag of choice for protecting that special dress! Kerry Houston TCRG is no stranger to the world of Irish Dancing. From her successful competitive career, touring with Riverdance – The Show and teaching at Houston Academy of Irish Dance. Kerry’s love of dance is equally matched with her love of costumes. With such well versed history and experience in the dance scene, it’s only natural that Kerry has entered into the world of dressmaking. Starting as an “Off The Rack” business creating one of a kind ready to wear costumes, Kerry Designs has quickly gained popularity and is now accepting orders around the globe! I am a professional color analyst and image consultant and have been involved in Irish dancing for nearly 20 years. I am more than qualified to advise on color and style of wigs and bun wigs. Thousands of dancers all over the world have learned Irish dancing from Olive Hurley's instructional videos! If you are a complete beginner, or wish to improve your current steps, perhaps learn new more advanced steps and techniques, or preparing to become a teacher – you will find everything you need on these terrific informative DVDs & Video. Run by mother and daughter team, Paula O'Donnell and Shannon Doherty, Paula's Wigs and Bling is based in Glasgow, Scotland, and supplies and ships worldwide Irish wigs (full length, bob, double bun wigs, single bun wigs, loose curled wigs) and accessories (shoes, sock glue, tiaras, buckles, poodle socks, diamond socks, hair accessories, number clips, Irish dancing wig conditioning spray etc). We also provide a wig fitting service and full make up packages. Sport specific fitness training for Irish dancers of all ages and levels. Short and effective workouts available with Podium On-Demand. FREE 3-day trial! Our exciting new range of inspirational t-shirts, posters, phone cases, and more will have you ready for the feis season. 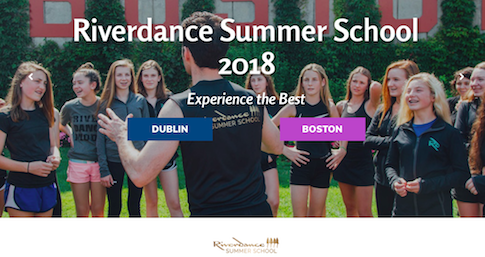 Experience Irish Dance Instruction from WORLD CHAMPION instructors and the BEST outdoor activities the Canadian Rocky Mountains has to offer! ReFeis That Dress is a consignment sales that accept and sell Irish dance costumes all over the world. Helen & Amanda take the time with each client & find them their “Say Yes to ReFeis That Dress!”. For the dancers in a pinch – they offer costume rentals! Their website allows buyers to narrow choices quickly so they are not searching through unwanted dresses. For more information, be sure to check them out at www.refeisthatdress.com or on Facebook and Instagram! Dancers aged 12 and older with at least 5 years dancing experience are invited to apply. Rutherford Products is the leading producer of Irish Dance Shoes, Irish Dancing Shoes, Irish Dance Wear, and Irish Dance Accessories worldwide. We are the makers of the now famous Sound-blaster/Sandglass tips, and HyTech heels...the loudest heels and tips anywhere. They come standard on all on Rutherford Jig Shoes, and are the overwhelming "Choice of Champions". We are the inventor and leading maker of the popular Black Suede Super Flexi Jig Shoe...the most flexible jig shoe anywhere...and a phenomenal shoe for toe-walking. We sell only the finest quality products. We also are the leading N. American distributor of Hullachan Reel Shoes, and offer an outstanding collection of Ghillies including the Hullachan Reel Shoe, and Rutherford Black Suede Sole Ghillie. Ryan & O’Donnell are a division of AE Struthers which is a family owned business that was founded in 1984. We have always been in shoes, successfully manufacturing and selling Highland Dance pumps, Gents shoes and Ghillie Brogues under our brand Thistle Shoes. Several years ago we were presented with a challenge, to innovate Irish Dance shoes. We have created a new hard shoe that is much lighter and more durable. Our tips and heels are constructed using a honeycomb technique that offers both greater durability and lightness. All our shoes feature a class 1 medical shock dispersing insole. You combine this with fine Italian leathers and we have a shoe that is the lightest and loudest in the market place. Ryan & O’Donnell are about creating excellence in footwear which is ‘designed for purpose’, offering supreme comfort, the correct support, unsurpassed sound definition, out the box flexibility and the ultimate shock dispersing system to help maintain healthy feet in such a rigorous sport as Irish Dancing. Book the ShamrockRs for your next party or special event! The ShamrockRs, a Virginia family of three champion-level Irish dancers, offer uniquely choreographed performances year-round for festivals, weddings, parties, St. Patrick's Day events, birthdays, and much more! Their amazing audiences react with thunderous applause, handshakes, high-fives, laughter, and joyous shouts! Their shows feature original dance choreography, drama, music, props, musical genre twists, colorful costumes, personally-engineered stages, sound systems, and more! Each individual show differs from the next. They customize each show to best fit your great audience. The ShamrockRs have performed their show with internationally renowned bands (Gaelic Storm, We Banjo 3, The American Rogues, etc.) and local bands/soloists (Dublin 5, The ShamRogues, Aine O'Doherty, and more). They have entertained many audiences from schools to Irish parades to charitable events and cultural Celtic festivals to the DC Shamrock Fest to the stage of the prestigious John F. Kennedy Center and to various Irish pubs in America and Ireland. The ShamrockRs would enjoy performing for you too! Yes, the ShamrockRs will travel! Please contact them at ShamrockRs@aol.com immediately and visit www.ShamrockRs.com for more information! SKIN SHIELDS by Rhythm Nation are dual layer anti-blister training socks, designed specifically for Irish dancers to absorb friction and protect the feet during training. The dual layer construction absorbs the friction between the foot and shoe while the inner sock features Meryl® Skinlife; a patented polyamide fibre with antimicrobial agents to keep the skin cool & dry. The outer cotton sock draws moisture away from the feet, keeping the skin dry and minimising skin breakage. An arch grip, soft-touch reinforced heel and toe along with a flat seamless toe provides additional comfort and protection. Train for longer and in comfort in Skin Shields - €19.95. Check out our product page for product details and customer reviews! Taylor dresses Belfast was established by Geraldine Taylor to design and produce bespoke Irish Dance dresses suited to every dancer. Geraldine and her daughters work hard to produce a high standard costume with originality and style. As owner of the successful Irish dancing business, Embroidery Girl, Siubhan Clark has been creating unique items for the Irish Dance Community for over 10 years. Her latest product The Perfect Point combines her University degree in Sports Medicine, her crafting abilities and her role as an Irish Dance Mom. When her daughter, Maiti, two time W.I.D.A. World Champion, wanted to improve her arch strength, the research began. Ballet dancers have had the advantage of similar products for decades. The Perfect Point stretches the muscles on the top of the foot while strengthening those in the arch. In just minutes a day, a dancer can achieve stronger, more flexible foot musculature ultimately improving arch and point work. Interest in the Perfect Point has spread worldwide. Siubhan is excited to introduce Sharon Doherty of Dance Dreams in Northern Ireland as the distributor for The Perfect Point in the UK, Ireland and Europe at www.dancedreamgifts.org.uk, or 'DanceDreams Gifts' on Facebook for more information. The Irish Dancing and Culture Magazine is the preeminent source for all things Irish Dancing, and irishdancing.com is the home of the magazine on the web! What is Irish Dancing Magazine? Irish Dancing & Culture Magazine ( Irish Dancing Magazine) is the world's leading magazine and website dedicated to Irish Dancing & Culture. Published monthly, IDM contains the latest results, news, and photos. Meet dancers from all over the globe. Dancers and adjudicators share advice PLUS learn about the latest trends. Don't miss a single issue!